The Statistics Speak...Now Is the Time to Win Your Fantasy Football League! Most people think fantasy football leagues are won and lost during the draft. While that's partially true, you shouldn't ignore your roster once the season starts. Just like businesses use Quality Management to improve their product, you should use data analysis to improve your fantasy football team! Earlier this year, I used Minitab's regression analysis to make a model to predict fantasy football scores. However, the model wasn't very accurate. With a predicted R-Squared value of 58%, I found that you can't accurately predict how a player will perform based on his average fantasy points from the previous year. But now that we have 5 weeks of data from this year, let's see if we can improve the model. Here's my dataset. I used the same players I had in the last analysis. Except I didn't use data from the 2009 season. Instead, I used a player's average from the first 5 weeks of the 2010 season to predict his final average in 2010. Here are the results. The R-squared value is almost 82%, which means 82% of the variation in a player’s final season average can be explained by his average through the first 5 weeks of the season. This is much better than the model that used data from the previous season. The fitted line plot shows the relationship. You don't see many players that had a very high average through the first 5 weeks, only to finish the season with a very low average. Or vice versa! I also did this exact same thing last year. I used the first 5 weeks of the 2009 season to predict how a player finished in 2009. So how does that model compare to this one? Look at how similar those are! The model from 2010 will predict slightly higher scores, but in most cases the difference is going to be less than 1 fantasy point! And considering how well our model worked last year, I think it's time to go ahead and use our model to predict which players will finish as the top 25 fantasy players this year. One more quick note. R-sq (pred) is a more appropriate metric than R-sq or R-sq (adj) for comparing the predictive ability of various models. The R-sq (pred) is 81.26%, so we're good to go with this model! * Indicates a player that has not participated in 5 games yet this season. The predictive model is based on players who played in all of the first five games in previous seasons, but, here, the model is used to predict for some players who have not yet participated in 5 games this season. No surprise to see Aaron Rodgers as the top QB. But Cam Newton isn't too far behind him. Two weeks ago I was saying that you should trade for Cam Newton. This just further supports that idea. Perhaps the biggest surprise is Eli Manning. Did you even realize he was a top 10 QB this season? I didn't until I saw the numbers. And look at Philip Rivers and Matt Schaub! Neither is in the top 10! So if you have a "big name" quarterback that's ranked low, you should definitely consider trading him for a "small name" quarterback ahead of him. Obviously you want Newton or Stafford, but at this point their owners may not want to trade them. But I'm sure Eli would be on the table! And don't settle for just Manning. If you're trading Schaub or Rivers, you can probably get Manning and another player, like Willis McGahee. That's how you can win your fantasy football league. Speaking of running backs, is Fred Jackson really the #1 RB? You better believe it! If an owner in your league thinks they're being smart by selling high on Jackson, jump on that deal! Top preseason running backs Adrian Peterson and Arian Foster are toward the top of the list. But what about Chris Johnson and Rashard Mendenhall? Neither one made the top 25! 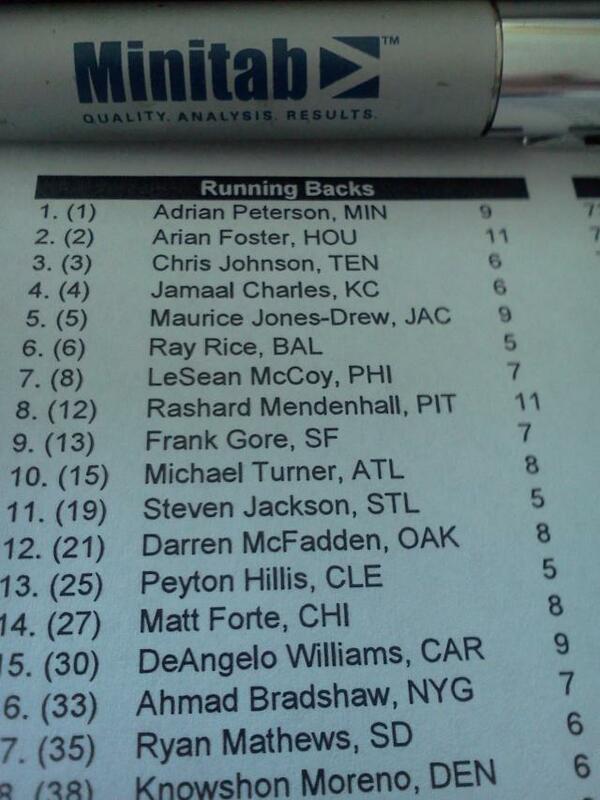 Chris Johnson is projected at 31, and Mendenhall is 36th. If you own either one, find the best deal you can and jump ship now! There's the top 3 guys, and then there's everybody else. Miles Austin has played in only 2 games, so we can't be too confident in his projection. But Wes Welker and Calvin Johnson are definitely a notch above everybody else. I doubt any owner would be willing to trade either of them. But if someone is, those are the receivers you really really want. Speaking of really wanting, Victor Cruz is owned in only 79% of ESPN fantasy leagues. And he's a top 15 receiver! Pick him up if you can. And yes, that is Roddy White all the way down there at 21. If you own him, you can probably still get good value on a trade. I would do it before the rest of your league realizes how bad he's doing. Jimmy Graham is scoring enough points to be the #7 receiver. If you're deep at receiver, you could probably trade one with a "big name" for Graham (Roddy White anybody????). Also, Aaron Hernandez is still available in 13% of ESPN fantasy leagues. Yes, his projection is based on only 3 games, but if he's a free agent, he's worth picking up! What trade can you make? See any other juicy deals that you could make based on these projections? In my league, I've already traded Mendenhall for McGahee and acquired Newton. Let us know about any trades you've been able to make!